It prompted other social media users to demand his arrest for child abuse. He was charged with endangering the baby's safety following his arrest on Sunday, police said. The child was dangled out of the 15th-floor window of an apartment block in the capital, Algiers. 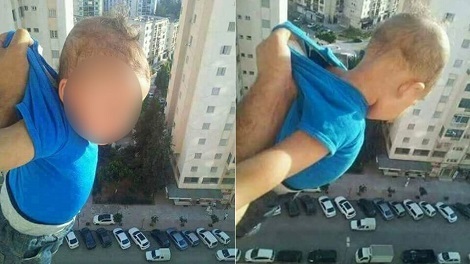 The man, who is a relative of the child, denied he put his life at risk, saying the image had been altered by social media users, Algeria's privately owned Ennahar TV reported. "The picture was taken in a balcony with protective barriers. These were removed," he was quoted as saying. The child's father urged the court to forgive the man, saying he had just been playing a game. However, the judge ruled against him, saying the picture was clear and the child's life was in danger.